After a few weeks of voting, here are the results of the poll about ‘Twilight’! 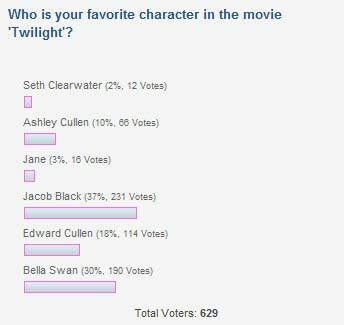 The least favorite character in Twilight is Seth Clearwater, with only 2% of all votes. Close in front of him is Jane, with 3% of the votes. With 10% of the votes there is Ashley Cullen, also not very popular. But then, with 114 votes, that is 18%, it’s Edward Cullen, giving him the third spot on the list. Second on the list is Bella Swan, with 190 votes, which gives her 30% of all the votes. And your favorite Twilight character of all times is: Jacob Black, with 231 votes, that’s 37%! Please vote on our next poll, about what you love doing the most on a nice, hot, summerday! I LOVE TAYLOR LUTNER SO SO MUCHHHHHHHHHHHHH!!!!!!!!!!!!!!!!!!!!!!!! !